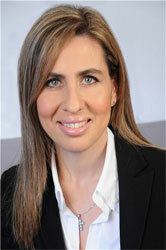 The Greek Mediation Institute was founded by Elena Koltsaki and Nana Papadogeorgaki; It’s main focus is to promote alternative dispute resolution and more specifically the newly introduced institution of Mediation. 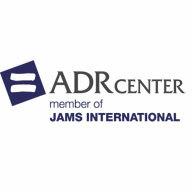 Mediation can be defined as a structured process during which two or more parties attempt voluntarily to reach an agreement on the settlement of their dispute with the help of a neutral and expert third and more specifically with the help of a specially trained, accredited mediator. Mediation is regulated by Law 4512/2018 and is part of the Greek legal reality. The "Greek Mediation Institute" encourages and promotes the use of alternative dispute resolution methods, both from the legal world and the Greek society. The International Academy of Dispute Resolution – INADR (www.inadr.org), headquartered in Chicago, USA brings FOR THE FIRST TIME in Greece an international competition – acquaintance with mediation. 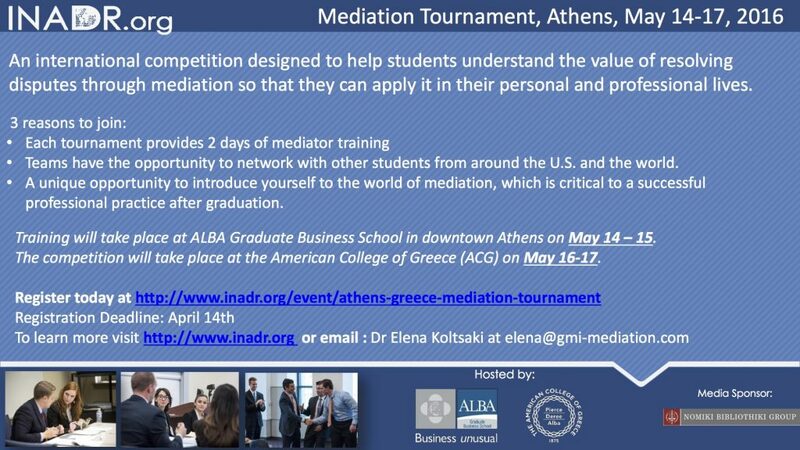 On 14-17 of May 2016, an international competition will be held in cooperation with ALBA Business School and the American College of Greece offering many benefits for the participants. All students will have the unique opportunity to be acquainted with the dispute resolution procedures, and more specifically with mediation which is now growing in Greece. The first two days will present a more theoretical approach, with experienced internationally recognised mediators offering their know-how on mediation procedures and techniques. The competition phase will be conducted during the latter two days, offering the participants the opportunity to “test” the procedure and their knowledge. Mediation is the attempt to help parties in a disagreement to hear one another, to minimise the harm that can come from disagreement (e.g. hostility or ‘demonising’ of the other parties) to maximize any area of agreement, and to find a way of preventing the areas of disagreement from interfering with the process of seeking a compromise or mutually agreed outcome.